Don’t worry if this one has you completely stumped – it did me! 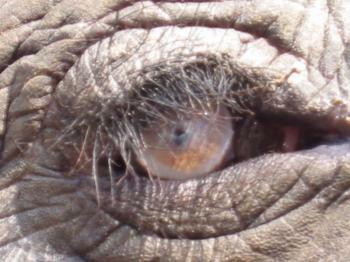 This Elephant in an Algerian zoo has a white hazy appearance to the cornea with blepharospasm and a discharge from the eye. What could be going on and has it a human counterpart? As I say I really hadn’t a clue and it was Khyne Umar who is an elephant expert currently working on a PhD at London Zoo who helped me out. It is hypovitaminosis A, apparently a common problem in poorly fed elephant in Asia and xerophthalia, as it can be known, is widely seen in people in the Third World too. 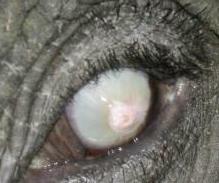 The elephant in this picture also has corneal trauma from periocular lice infestation. This entry was posted in Cases and tagged elephant, hypovitaminosis A, xerophthalmia. Bookmark the permalink.